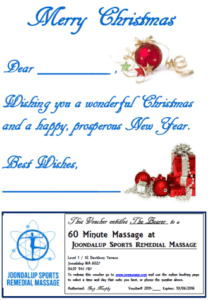 Gift vouchers are a great idea for Birthdays, Anniversaries, Mother’s or Father’s Day and for Christmas. They make great prizes for raffles and awards. They can be plain or have a special message included. They can be redeemed for any 1 hour massage, and you can book online with them. Purchase is easy with online banking, and we can post them out on the same day if required. Express Post costs $10 extra. Voucher is posted out on the day of payment confirmation. However, if you live locally, you can pop in and pay at reception and take the voucher home on the same day. Which method would you like to use? You can call us if that is easier for you on 0429 941 787. To redeem a gift voucher, simply book online and in the MESSAGE BOX, tell us you have a voucher. Bring the voucher in with you on the day, and hand it to the person on Reception.